EFI technology for triplex pump is a step forward for small engines. 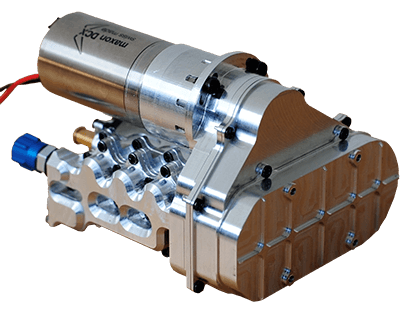 The triplex pump represents a substantial step forward for EFI technology in small engines. This device has been developed by Currrawong to provide high-pressure, regulated fuel delivery of particular application to heavy fuel and gasoline engines. Its unique phased three-piston design, combined with an integrated control system, provides very precise regulation of fuel delivery across a wide range of pressures. This pump provides integrated pressure regulation and flow-metering and can accurately report the amount of fuel delivered. * Variant with high speed motor CE822-03. Pressure and flow rate performance depends on pump configuration.